I am an avid Twitter fan. It is the social media platform I’ve found to be the most effective in building relationships and keeping up to date with the latest healthcare news. I like to use Twitter in a strategic way and one of the ways I do this is by creating Twitter lists. By separating those I follow into lists I can zoom in on the updates from the people I really want to hear about. Over time however I have noticed my Twitter lists become less effective, chiefly because I cannot easily filter or search the lists I have created. I am an avid Twitter fan. 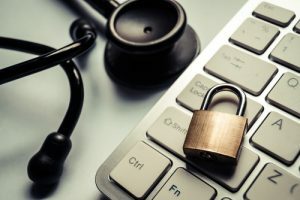 It is the social media platform I’ve found to be the most effective in building relationships and keeping up to date with the latest healthcare news. I like to use Twitter in a strategic way and one of the ways I do this is by creating Twitter lists. By separating those I follow into lists I can zoom in on the updates from the people I really want to hear about. Over time however I have noticed my Twitter lists become less effective, chiefly because I cannot easily filter or search the lists I have created. Some lists have become cluttered and irelevant and I am less inclined to share them with others as the useful, up-to-date resource I would like them to be. Several months ago I decided to try out List.ly (a collaborative list building tool) as an alternative way of helping me to create and categorize my healthcare lists. I started off with a list of doctors I was already following on Twitter, and invited my Twitter followers to add to the list. 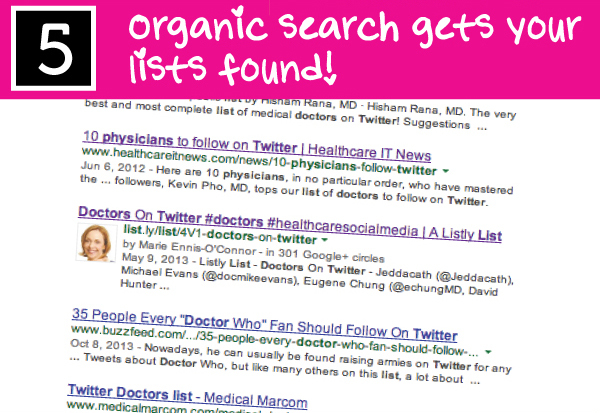 This list has grown exponentially to over 600 Doctors, tagged according to their location and their medical speciality. And the list keeps growing. It is a dynamic list which can be added to over time to reflect the growing number of doctors who are venturing into the Twittersphere. I chose to categorize my list alphabetically for ease of use, but you also have the option to sort lists by crowd ranking and by most recent or oldest members added to the list. Aside from the usefulness of List.ly for helping me manage my time more productively on Twitter, I have discovered other benefits to creating these lists which I will share with you now. We know that lists appeal to the human psyche. We are attracted to lists about things we love to do and learn about. 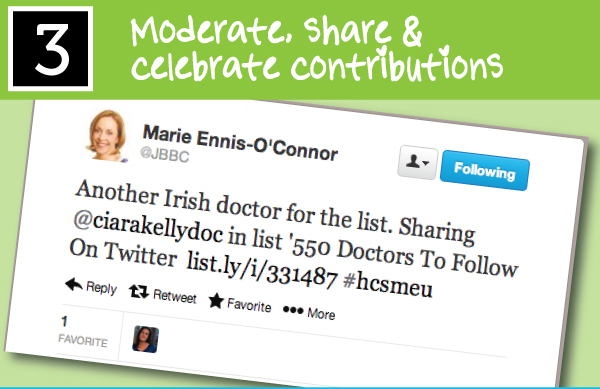 Lists shared in social media generate significant numbers of views – to date my list of doctors on twitter has over 9k views. 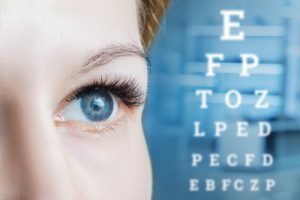 With their bite-size information, easily digestible at a glance, lists are highly shareable. 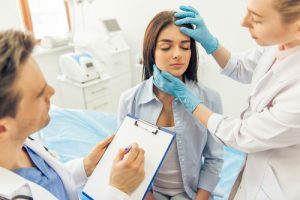 My Doctors On Twitter list has been shared among healthcare professionals as a way to quickly find and connect to doctors in a particular field of expertise. List.ly is highly collaborative and offers a broad appeal. Once you’ve created your lists, you can then invite others to contribute and subscribe to the lists that reflect their own healthcare interests. 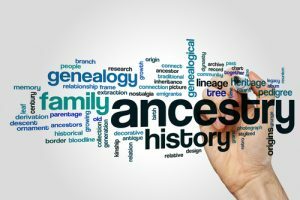 This creates what Nick Kellett, co-founder of List.ly, calls living networks or communities, creating breadcrumb trails with links back to both useful sources and useful people. 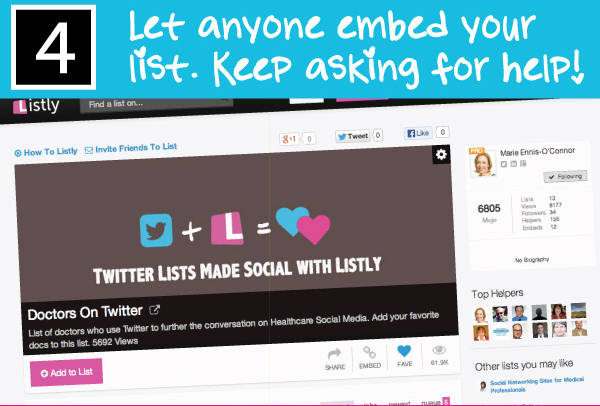 List.ly’s latest feature, released this week, allows you to combine your List.ly and Twitter lists. 1. 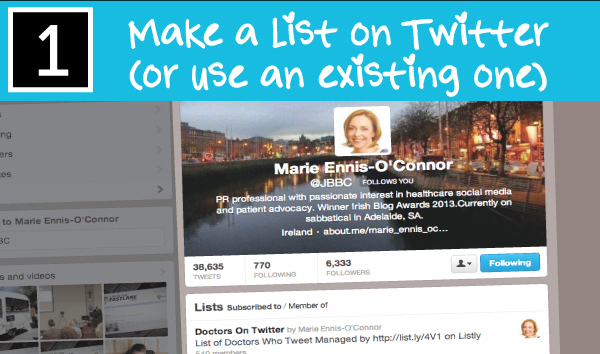 First create a Twitter list – this list can be already populated or it can be empty. 2. 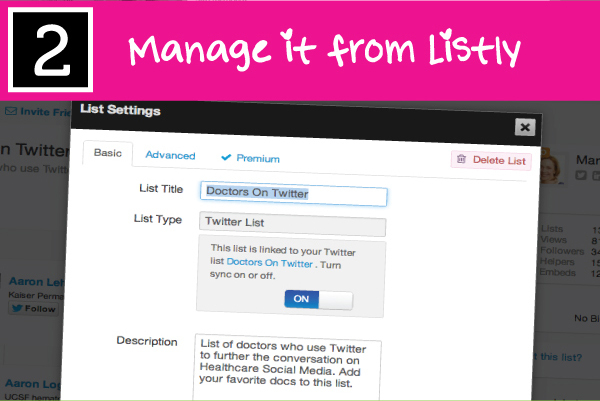 Create a List.ly list, choose type = “Twitter List” and pick your Twitter List. It will take a few minutes for additions to hit the Twitter list. You will get notified via Twitter when your processing is completed. You can import Twitter lists from existing lists. This will remove duplicates, so you can use this to combine multiple lists. Just don’t add to your lists directly from Twitter or you will need to reimport. All the automation flows from List.ly to Twitter, so adding people to your List.ly list will automatically add them to your Twitter list. 3. Share your list and invite others to contribute. By turning on moderation you get to approve what is added. You can choose to share your entire list or a single person. 4. With the option to embed a list on your website or blog, List.ly is an effective way to drive traffic to your site. Allow others to embed your lists on their sites too – allowing you to track enagagment. 5. Organic search results are listings on search engine results pages that appear because of their relevance to the search terms. I have seen a marked increase in mine with List.ly. Since starting with my Doctors On Twitter List, I have gone on to add lists of nurses, healthcare journalists, medical journals, patient advocates and patient support groups. The potential for creating lists is only limited to your imagination. To set up a list is free, but Twitter lists is a premium feature. However, the good news is if create your Twitter lists before January 14 2014, those lists will be free. So why not create your own lists and don’t forget to share them with me. Looking forward to working with you in creating more helpful healthcare lists for learning and colloboration. Is Our Medicaid System Vulnerable to Collapse in 2014?